Eating out when you feel like Chinese food isn’t really something I do much, if at all. Chinese restaurants and takeaways just don’t offer the kind of dishes or food I’m used to when eating home cooking with my family, or eating out in Hong Kong. It might be talked to death and becomes a cliché (cue the eye rolling), but the food served in each country is tailored to the majority of the population’s tastes. The only real way to get the food I’m used to is to cook it myself at home. When I was offered two of Yutaka’s new sauces to sample, I was intrigued. I was very happy to learn that they were vegan friendly and couldn’t wait to put my culinary skills to the test. It can’t be that hard to try cooking with sauces you’ve never tried before, right? 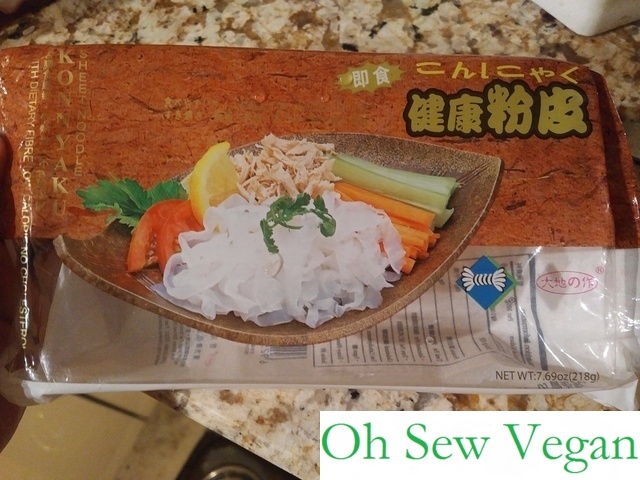 Note: The Yakisoba and Sesame & Miso sauces were sent to me for review, however the review and recipes are entirely my own and reflect my own opinion. The clever Yutaka Company have just launched two new Japanese classic sauces and their new sauces are saucier than ever! The Sesame & Miso sauce which is rich and nutty full of sesame goodness and enhanced with soybean. By looking at the colour, it reminds me of the savoury peanut sauce used with Vietnamese summer rolls or in pad thai. Peanut sauce is also sometimes used in Chinese cooking and going by the description on the label, it would be suitable for use as a salad dressing. 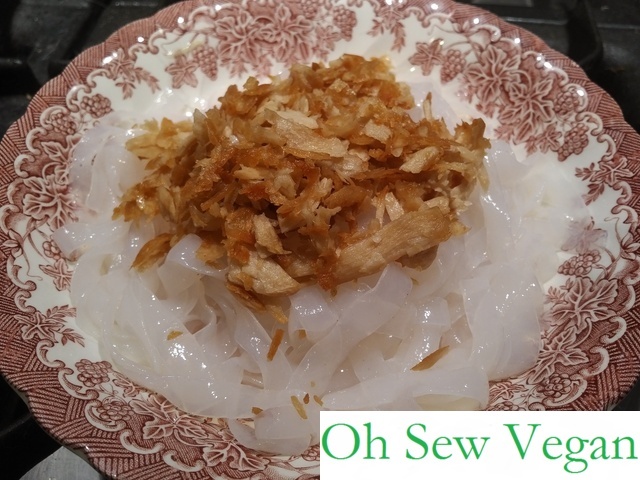 Given that one of the main ingredients is sesame, I decided to make a favourite Shanghainese cold noodle dish of mine. The nutty flavour of the sesame would work well with the slight salty and tangy flavour of miso for the dish. 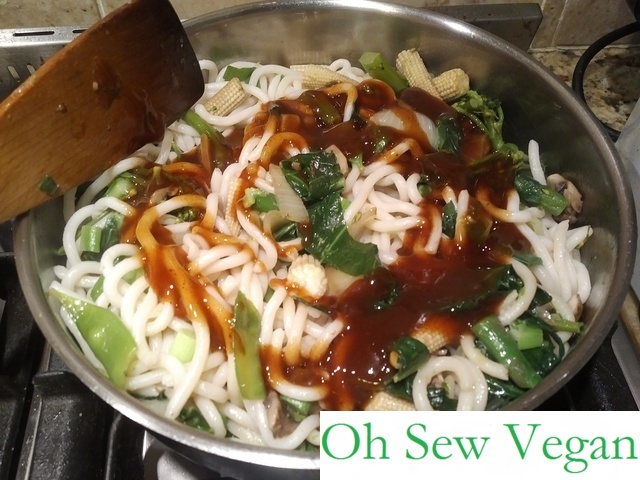 Similar to ho fun noodles, this dish uses Japanese konyaku noodles which can be bought from Chinese supermarkets. 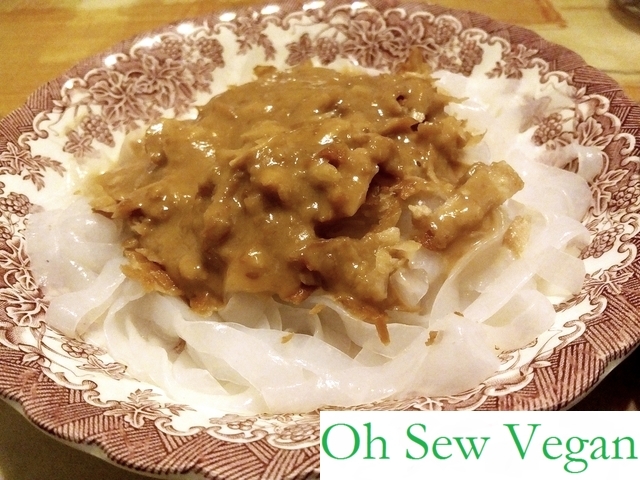 The traditional dish makes use of chicken, but in this vegan version, I used a frozen bag of Linda McCartney’s pulled chicken (here) as a substitute. 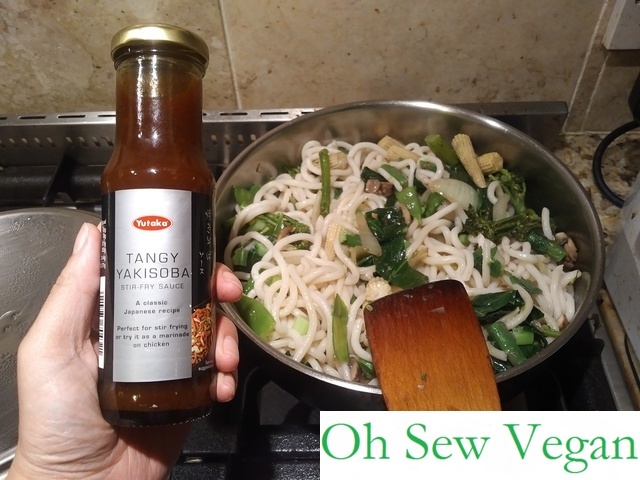 The Yakisoba Sauce on the other hand is sweet and savory and perfect for stir frying or as a marinade. The colour reminds me of that rich brown colour of BBQ sauce. Since it’s perfect for stir fry dishes or used as a marinade, I imagined it would have a rich slightly thick texture with a sweet flavour like hoisin sauce. 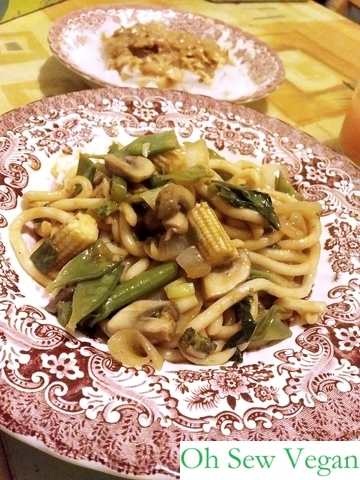 Yakisoba is a Japanese stir fry noodle dish similar to Chinese Chow Mein so I decided to try making stir fry noodles with a Japanese twist: with udon noodles. Stir fry dishes are fantastic because they’re so easy to cook. 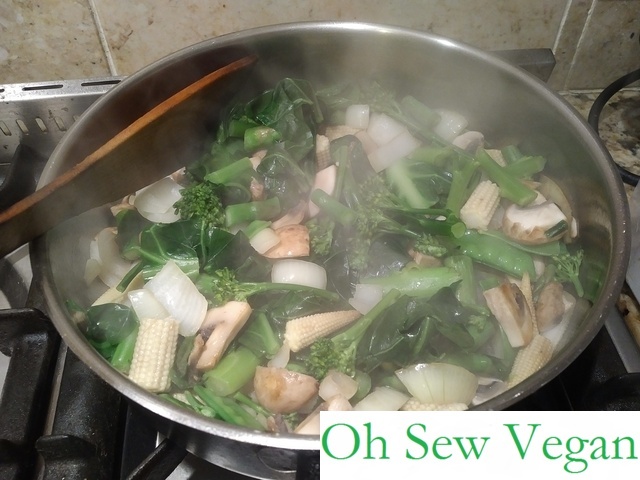 When cooking vegan stir fry, you can use any vegetables you want. I tried to make this dish with different vegetables to give the dish a variety of textures, but you’re more than welcome to use whatever vegetables you prefer. 1. Drain the konyaku sheet noodles and rinse well under cold water as per the instructions on the packet. 2. Heat a pan and over medium heat and a bit of oil, fry the pulled chicken for a few minutes until heated through thoroughly. 3. Place the drained konyaku noodles on a dish and carefully add the cooked pulled chicken on top. 4. 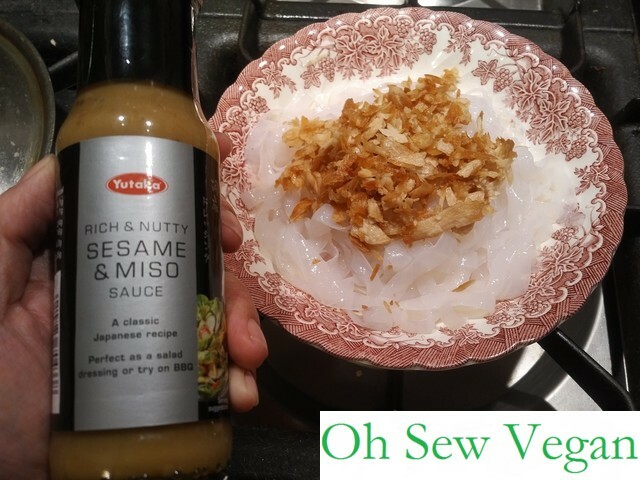 Generously pour the Sesame & Miso sauce on top and serve. 1. In a pre-heated pan, quickly fry the chopped vegetables on high heat. 2. 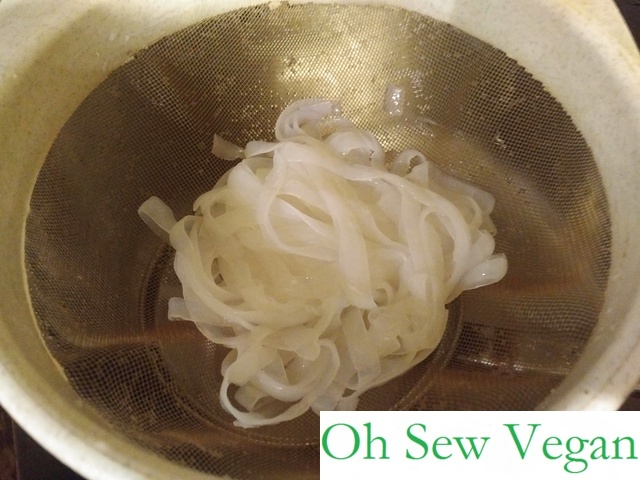 Boil water in a separate pan (or in a heat-proof bowl) and add the udon noodles. 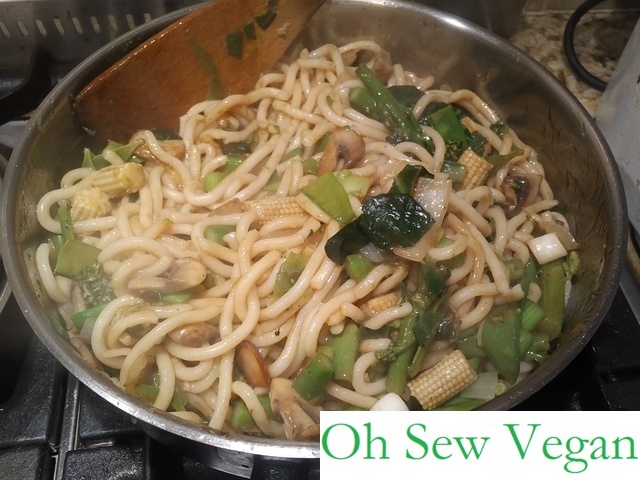 (I followed the instructions on the packet but should have followed my instinct to do this first, it means the noodles won’t stick to the hot pan). 3. 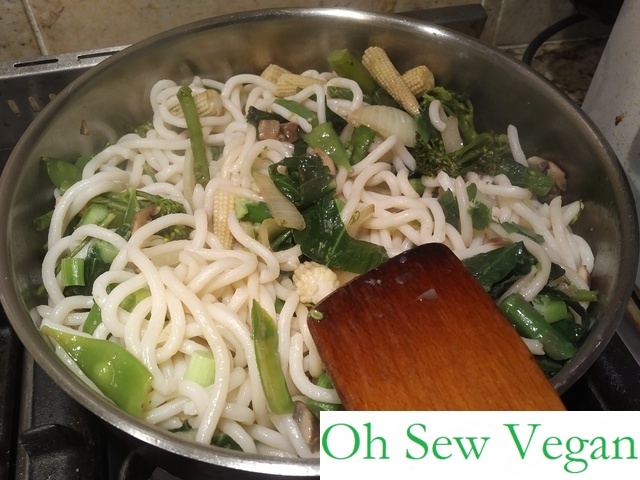 Add the udon noodles to the pan of vegetables and stir to mix it well. 4. Add the Yakisoba sauce and stir through thoroughly. 5. Dish the noodles and serve. I normally wouldn’t have been able to order the two dishes at the same time as one is a Shanghainese dish while the other more like a Japanese dish, so it’s not likely to find both served in the same restaurant. 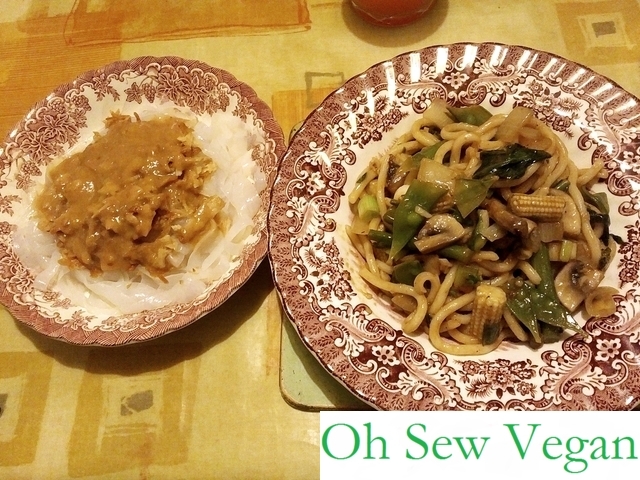 I did like the contrast between the slight savoury and milder flavour of the Sesame & Miso sauce with the al dente cold noodles compared to the tangy Yakisoba sauce with crunchy vegetables and soft udon noodles. The cold and hot temperatures also worked great together, kind of like having cream or yoghurt with a spicy curry. Even the chef OH approved! 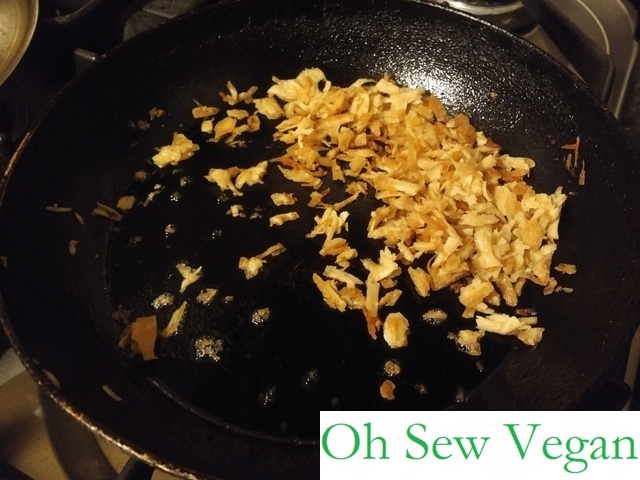 If you try my recipes above, do let me know how you get on and what you thought in the comments below with any suggested adaptions you made to your own dishes or would make! 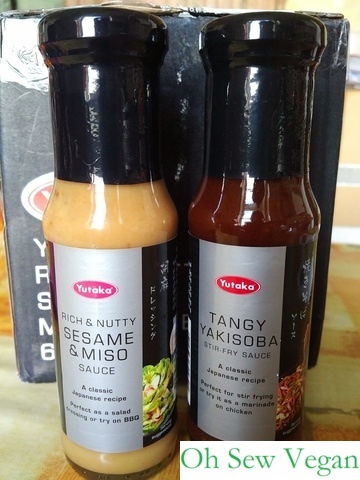 Both the Yakisoba and Sesame & Miso sauces are available from Tesco RRP £2.30. Thank you to Yutaka Company and Mad As A March Hare for providing the Yakisoba and Sesame & Miso sauces for me to review.